Look what Falcon and Sophie did! 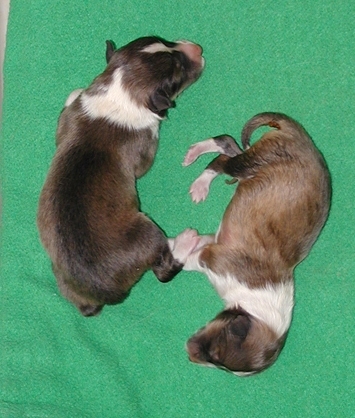 Check us out - one dark sable boy and one light sable girl born May 13, 2006. We take after our proud parents with Falcon the darker father left and Sophie the lighter mother right. 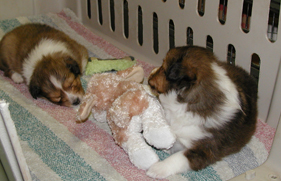 We are the first litter for Falcon. 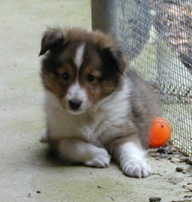 You can also see him at the bottom of our grandmother Sassy's page or as a puppy at Sassy's 2004 litter. 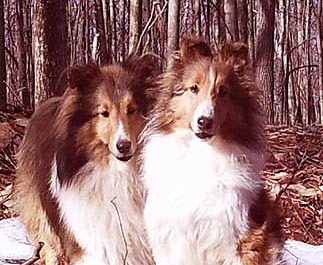 Our Mom Sophie has her very own web page with a lot of family history and link to last year's siblings, too. These pages will give you our pedigree which combines the Calcurt legacy with some special outcrosses. Sophie keeps an eye on us as newborns. We look very tiny with the boy near Mom's head and the girl behind. This is our very first portrait with the light girl called Belle right and dark boy called Beau left (just like our parents). So look out world, we are ready to grow. 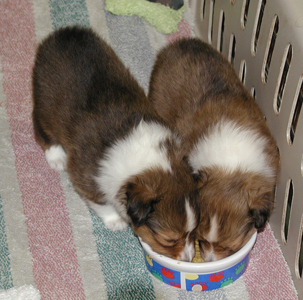 By three weeks we have moved to a bigger area and are starting to eat frow a bowl. And we now know how to play. 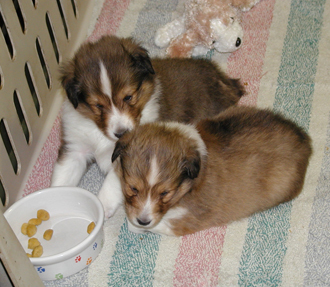 We were almost five weeks here and eating real dog food. 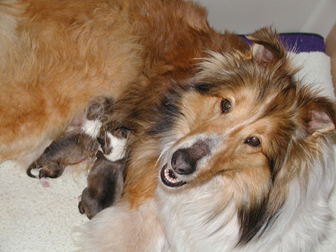 So mother is free to join the big dogs and we get to be babied by people. We spent our sixth week with Aunt Susan and learned to play with new people and cats. By seven weeks we are back home spending more time outside. While Belle is thinking she may stay here. 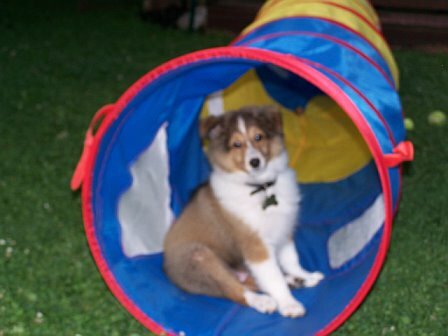 Beau says it's fun to be an only dog. While Belle waits to grow up. At the end of the year Belle is joined by two other Falcon kids Nick and Holly . So we plan to show you how Falcon kids develop. And here is a family picture. Of course Belle grown up is in the foreground with Falcon and Sophie the proud parents. Peeking behind is Nick with his mother Sally in the background left. And background right is the source of it all, Calcurt Silver Sorceress "Sassy". 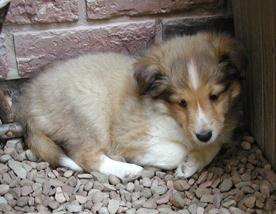 Now Belle has decided to live with cousin Buttons at Millennium Shelties. She thinks it is time to share the Falcon legacy. Here is Belle's first picture in her new home (thanks to StoneyAcre). Although she is obviously out of coat and uncomfortable you can see the quality to come. 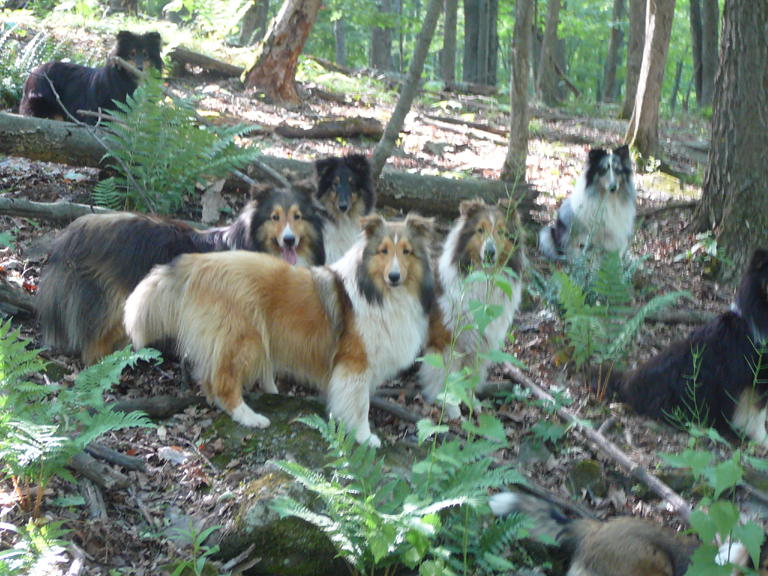 Since Belle needs time to mature she decided to share her potential by giving Millennium Shelties two lovely girls. And so the family continues. Wonder what's next.